CHKDSK (short for “check disk”) is a command on computers running DOS, OS/2 and Microsoft Windows operating systems that displays the file system integrity status of hard disks and can fix logical file system errors. The command is implemented as an executable program file, CHKDSK.EXE. Different operating systems all use the same filename, but the files are not necessarily compatible between operating systems. On computers running NT-based versions of Windows, CHKDSK can also check the disk surface for physical errors or bad sectors, a task previously done by SCANDISK. Checkdisk command can be run in 2 ways via Command Promt and through My Computer or Windows Explorer . 1. 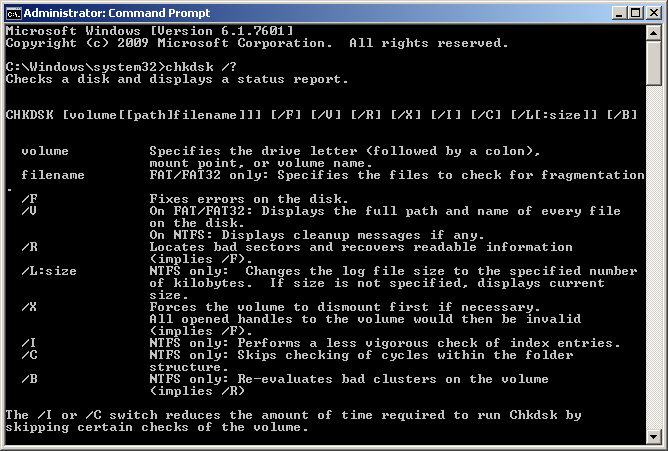 Run CHKDSK command from Command Prompt. The command will run CHKDSK on Drive D in read-only mode. Command is used to repair errors without scanning for bad sectors. Command is used to repair errors, find bad sectors and recover data. 2. Running CHKDSK command from My Computer or Windows Explorer. Right-click on the hard disk that you want to check, click Properties. Click the Tools tab, Error Checking click on the option Check Now .. Check disk options window will appear. To run Chkdsk in read-only mode mode, click Start. To repair errors, find bad sectors and recover data select Scan for and Attempt recovery of bad sectors, – You can also check the two options if necessary. If the message appears: Chkdsk can not run Because the volume is in use by another process. Chkdsk may run if this volume is dismounted first. Opened ALL HANDLES TO THIS VOLUME Would THEN BE INVALID. Would you like to force a Dismount on this volume? (Y / N) type Y and Enter. If the message appears: Chkdsk can not run Because the volume is in use by another process. Would you like to schedule this volume to be checked the next time the system restarts? (Y / N) Type Y, and ENTER and then restart the computer to run Scandisk. That’s way to fix hardisk computer using Checkdisk command in Windows operating system, Good luck..